I love herbs and have many favorite herbs that I feel I couldn’t live without. One herb that I always have in my house is aloe. You might keep it around for topical use on burns, but like many herbs, aloe has an impressive list of uses. Topically, aloe can help speed wound healing as well as calm itching from conditions like psoriasis. When aloe juice is consumed, it soothes the insides of the gastrointestinal tract just like it would the skin. But aloe can have a strong laxative effect depending on how it is prepared. The skin of the leaves contains laxative compounds called anthraquinone glycosides. If you want these compounds, buy a whole leaf aloe product that hasn’t been filtered to remove the anthraquinone. But be careful because long-term use of any laxative can lead to dependence. Probably the best aloe products to choose for internal use are made from whole leaves and then filtered. Though they lack the laxative anthraquinone glycosides, they are rich in immune supporting polysaccharides. These polysaccharides are highly concentrated under the skin of the leaves so the whole leaves are processed and then filtered to remove the laxative compounds. It takes a few ounces of aloe juice to get enough of these polysaccharides, but this may be a useful intervention for people who need an immune boost. 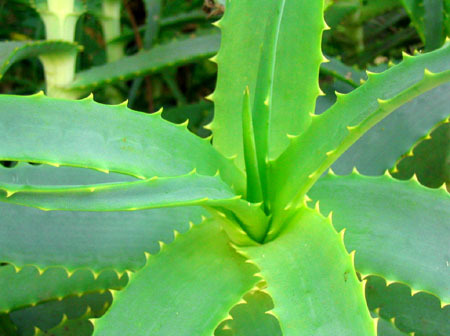 Since aloe is immune modulating, it may even help calm an overactive immune system. Aloe may also help ease inflammation, and since it has an affinity for the gastrointestinal tract, it is used particularly for inflammation of the gut. One final benefit of aloe is that it may be an insulin sensitizer that could help pre-diabetics improve their blood sugar control. This entry was posted in Health and tagged blood sugar control, Gastrointestinal Health, GI Health, immune support, inflammation. Bookmark the permalink.